It’s hard to study up on scaring after pounding 27 oz. of Blort. The story’s finest moment comes in its final minutes, when it finally refuses to be completely, utterly conventional and expected. But even then, it never attains to inspired. You may very well chuckle. But you almost certainly won’t care. With Monsters University, Pixar has a genuine failure on its hands. I only wish that meant it would have a flop on its ledger. A flop might call for some soul-searching; or, rather, it might call Pixar to go searching for its soul. 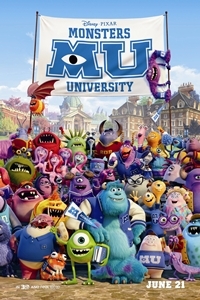 June 19, 2013 @ 10:46 a.m.
June 21, 2013 @ 12:31 p.m.
Review by "The Movie Mom" - " “Monsters Inc.” is one of my favorite Pixar movies, filled with wit, imagination, and heart. This prequel is a lot of fun, still very funny and wildly imaginative, but a little hollow where the heart should be." The review is much longer but overall she likes the movie. As she ends it, "Second-rate Pixar is still better than most of what is out there, but we do expect more."